With just three weeks left to our residencies, we are all in the midsts of wrapping up our projects (and thus this post is going to be a short one). Here at BAM, I am waist deep in documentation and making sure that there are understandable and tangible actions points to be taken after I leave. A big action point is the planning for a facilitated records transferring event this summer 2016. While creating Records Retention Schedules for an institution is a huge step, getting people to comply and actually transfer records to the Archive, is a totally different story. Understandably, it can be challenging to make records management a priority when peoples’ jobs are already so demanding. With this in mind, as part of this project, we asked each Department Head to appoint a Records Retention Coordinator within their department so that the Archives can have a specific point person with whom to communicate about transferring, identifying, and describing archival records. This summer, during BAM’s regularly scheduled “Digital Clean-Up Day,” the Archives are planning to set up a “Records Transferring Lab” where Records Retention Coordinators will be required to schedule a one-on-one appointment with the Archives and learn how to electronically transfer records into the Archive using AVPreserve’s file transfer tool, Exactly. 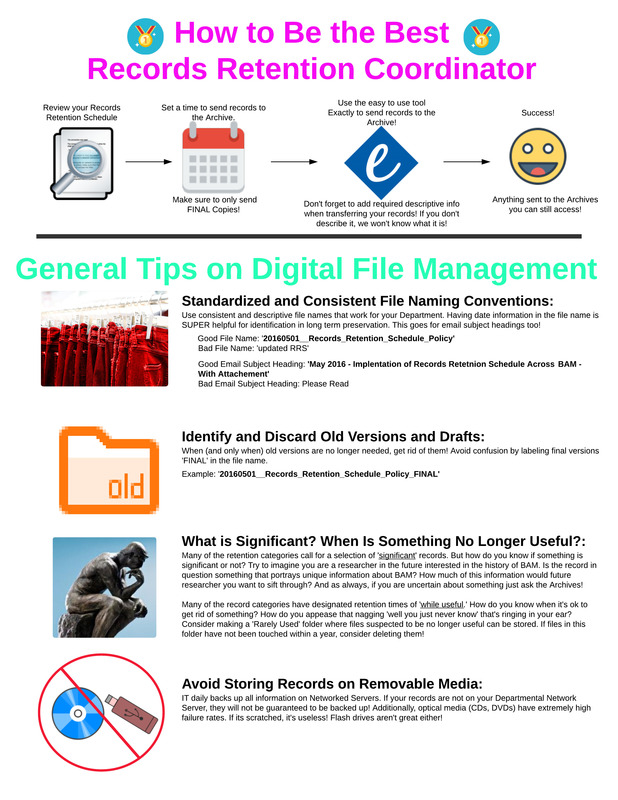 This entry was posted in Resident Blog and tagged BAM, Digital preservation, Records Management on May 6, 2016 by Carmel Curtis.